Hours: The New York Gardens are open year-round Tuesdays-Sundays from 10am – 6pm, closed most Mondays and Christmas Day. This Garden is a paid admission and you can view current rates and purchase tickets on their website. The New York Gardens are a living museum of plants, a scientific research organization, and an educational institution. This National Historic Landmark was founded in 1891 and is the largest in any city within the United States. One of the finest botanical gardens in the world, it is distinguished by its extensive gardens and collections, the diversity of its landscape, and the excellence of its programs in education, horticulture, and science. The New York Botanical Gardens has the largest and most diverse education program of any garden in the world and its scientific research on fungi and plants is unmatched. The Garden includes a horticultural and botanical library that is revered the world over, and has the world’s fourth largest herbarium that is the largest in the Western Hemisphere. The Garden is also home to a Victorian-era conservatory, a New York City Landmark and also the largest of its kind in the United States. 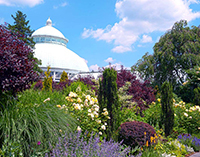 Visitors to the New York Botanical Gardens will find a wealth of activities, exhibitions, and programs to explore and enjoy across its sweeping 250 acres, including a 50 acre native forest and 50 finely manicured display gardens. The beginnings of the New York Botanical Gardens date back to the late 19th century and a renowned botanist named Nathaniel Lord Britton from Columbia University, and his wife Elizabeth who was also a botanist. After an inspiring visit to the Kew Royal Botanic Gardens in England, they, along with other members of the Torrey Botanical Club, were adamant that New York City should be the home of a great garden also. A fantastic site was chosen in the northern Bronx and in 1891 the New York State Legislature set aside the land for the creation of a public botanic garden for the City of New York. Financing for the project included prominent city leaders such as Cornelius Vanderbilt, Andrew Carnegie, and J. Pierpont Morgan, who agreed to match the city’s funding for the project. The New York Gardens has an International Plant Science Center that utilizes cutting edge technology to document, discover, and preserve the world’s vast botanical treasures, and is a world leader in exploration and plant research. Every year the Garden’s scientists race to catalog plant life around the world before it is lost forever to degradation of habitats and deforestation. There are few institutions anywhere else in the world with the expertise and the resources to develop and understand plant evolution and diversity. The New York Botanical Gardens has maintained a longstanding tradition of international field and laboratory research for more than a century. The Garden’s world class Herbarium contains more than 7 million specimens that span every continent around the globe dating back to the 18th century. The Garden’s library is an unmatched resource, spanning 10 centuries with over 1 million items in its inventory. The New York Gardens Press is one of the world’s premier science publications. The Garden offers a Graduate Studies Program that was established in 1896 to address a worldwide shortage of biological scientists, and since that time over 180 Ph.D.s have been granted. The program enrolls around 40 students annually and has grown to include premier universities such as Columbia, Fordham, and Yale. The New York Gardens is at the forefront of world botanical research. Azaleas & Rhododendrons Chrysanthemums: No fall would be complete without the classic beauty of these wonderful flowers. Children’s Adventure Garden Arthur and Janet Ross Conifer Arboretum: A recreation of some of the world’s most beautiful and wild forests. Crabapples Enid A Haupt Conservatory: First opened in 1902 and eventually named a New York City Landmark in 1973, the conservatory offers seasonal exhibits with mystical rain forests and arid deserts. It houses the most comprehensive collection of palm trees, and is also home to A World of Plants, which is a permanent exhibit that takes visitors through an ecotour of the world. The Conservatory is the location for the popular seasonal flower shows such as the Holiday Train Show, and the ever-popular Orchid Show. Daylilies Daffodils Fall Foliage: A dazzling display of autumn colors sure to impress. Flowering Cherries Ruth Rea Howell Family Garden: A garden created by kids where imaginations grow as well as plants. Nancy Bryan Luce Herb Garden: Fragrant herbs and curative spices to liven up the season. Forest: Rushing water and ancient trees offer an escape from the city life. Home Gardening Center Lilacs Ladies’ Border: Southern belles surviving the northern climate. Magnolias Benenson Ornamental Conifers: A collection of rare conifers offering endless inspiration. Orchids: Delicate, flamboyant, and bizarre flora from exotic locales around the world. Jane Watson Irwin Perennial Garden: A treasure of texture and color for every season. Peonies Rose Garden Rock Garden: An alpine oasis where a sparkling waterfall meets a variety of woodland plants. Tulips Seasonal Walk: Spectacular color from a seasonal collection. Other historic buildings on the grounds of the New York Gardens include the Library Building (1901), The Stone Mill (1840), and The Stone Cottage (1840). 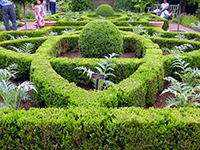 The Garden grounds are an extensive work portfolio by world-renowned architects and garden designers. Visitors are certain to find inspiration and ideas that they can take home and incorporate into their own garden designs.